Mr. Game & Watch needs to be unlocked. The man from the land of 2D gaming makes his Second Appearance in the Smash Bros. Series. One of the most under-rated characters in the game, and one of the most underestimated. Mr.Game&Watch appears slow to the eye, but his maneuverability in the air and his relatively quick and damaging air moves make for great combos. Mr. Game and Watch's up-B move does damage, is very fast, and is one of the few recovery moves that doesn't make you vulnerable. He can cancel the attack into any smash attack or even quickly fall to the ground. This opens up many options. Also, if your opponent is hanging on the edge of a map with no wall, just a ledge, like Final Destination or Battlefield, you can use his up-B to attack the edge-hogger and they might just bounce off the ledge and be sent into the abyss. Another good tactic is his downward throw combo. You can use many attacks after his downward throw, including Judge. His other throws can also lead into aerial attacks. If you're fighting a 1-on-1 with a projectile user whose projectiles can be absorbed by Oil Panic, then at the start of the match back away slightly and your opponent's first instinct is to open fire. Absorb as many attacks as you can before they realize that their tactic won't work against you, then blast them with Oil Panic. Mr. Game and Watch is 2D, which makes him one of the lightest characters in the game. During a battle where there is little time to KO people (e.g. in a free for all), generally Mr. Game and Watch will be picked on because he flies so far. Be careful of his weight weakness, and keep to the air where you can take on enemies one at a time. In the air, his down-A key attack can double hit, serving as a meteor smash. If your opponent is right next to you, use down-A which will trap the opponent and send them downward. Mr. Game and Watch is very light, but has some powerful attacks. He has very good offense if used correctly, and decent defense with Oil Panic. His projectile does minimal damage, and his Final Smash is decent. His throws aren't great, but can initiate combos, and he moves at an average pace. However, his backwards air is a great approach option. Mr. Game&Watch has two chain grabs. His first, use the down throw, then his neutral A (Air pump), then quickly grab the opponent and repeat. The second chain grab is a chase grab. Simply down-throw, then chase after your opponent and grab him again. Mr.Game&Watch can also slide-pivot-grab, however, he does not slide very far and this is hard to master. Here is a video that exemplifies some of the skills explained above: Game and watch in the 9th sense! a brawl highlight video. G&W presses an insecticide pump. Unlike most infinite combos, G&W can start the infinite combo without any other punch or kick before the combo starts. Doesn't launch opponent at all. Only good for pinning an opponent against a wall. G&W thrusts a chair out, launching opponents forwards. Sends opponents at a 90o angle at low damage, but sends opponents out at a 45o angle at roughly 100%. Although this and Manhole are G&W's fastest tilt attacks, it still has some lag and can be punished by a sidestepper. G&W waves a flag above him. Has two hitboxes, each doing 8%. One is up and a little in front of him, the other is up and a little behind him. Hits both sides with short range. It is better to use G&W's neutral or up air. + + + + Manhole Damage: 6% if hit on ground, 9% if they land on it. G&W swings a manhole in front of him. Sends opponents forward at a 90o angle in it hits an opponent on the ground, but sends opponents forward at a 45o angle if they land on it. G&W's fastest tilt along with Lion with a large duration and range. G&W slides a bit while wearing a helmet. Best used when right next to an opponent, for the slide is very small. Usually sends opponents at about a 60o angle behind you, but can sometimes launch the opponent in front of you. While a faster option than using up smash, it is better to short hop and then use any aerial. It does have one good use however; if it is used right next to a ledge of a stage while someone is on it, it will spike them down. Smash + + + (Smash + ) or (Smash + ) or Fire Attack Damage: 18% with c-stick, 25% if fully charged. He pulls out a match, holds it over his head, then brings it down. This is one of Game-and-Watch's best KO moves because of its deceptively quick start-up and huge launch speed. Launches opponents at a 45o angle. Probably your best smash for getting KO's. Smash + + + (Smash + ) or (Smash + ) or Octopus: Helmet Damage: 18% with c-stick, 25% if fully charged. He does an upward head attack with a diving helmet on. This is powerful, but much too slow, and has a very precise hit radius. Jump and use aerials instead. Launches opponents straight up. While this is probably his most powerful smash, it is too slow for using it very well against most somewhat experienced players. Smash + + + (Smash + ) or (Smash + ) or Vermin: Hammers Damage: C-stick: 13% if handles hit opponent, 15% if hammers hit opponent. Fully Charged: 18% if handles hit opponent, 21% if hammers hit opponent. He does a double hammer attack on the ground. It has a sweetspot at the hammers tips and a sourspot at the hammers' handles. It is reasonably fast, but pales in comparison to most of Game-and-Watch's A-moves. Also does less damage than his other smashes. Handles launch opponents at a 90o angle at low damage and at a 30o angle at high damage. Hammers launch opponents straight up at both low and high damage. It is good to use right after a down throw if you're not going to chaingrab to get extra damage and can use another after the first very quickly, but otherwise isn't of much use. 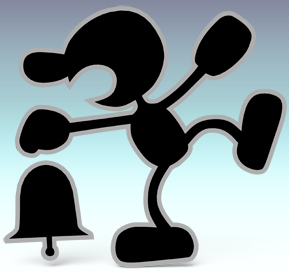 G&W bashes the opponent with a bell. Very slow. Juggles the opponent and throws them forwards at a 45o angle. Good to follow up with a forward aerial. Juggles the opponent and throws them backwards at a 45o angle. Can follow up with a back aerial for an extra 15% damage. Juggles the opponent and throws them upwards. Only good at low damage to combo with a neutral or up aerial. Juggles the opponent into the ground. While it is his weakest grab, you can chaingrab by pressing the jab button once immediately when your opponent hits the ground and grabbing again. You can do this until 999% damage if your opponent can't get out of it. However, it is very easy to escape this chaingrab by just tilting the control stick the opposite direction of being grabbed. Using this is risky, for if you press the grab button too soon, you will just go into the infinite combo and it is easily escapable. Use it a lot because of the chaingrab and combo potential. Tropical Fish Damage: 5%, 4%, 4%, 4%. 17% if all hitboxes hit. He holds a bowl of goldfish over his head and damaging fish jump out. It has a very small range, but is decent for enemies above you. Launches opponents straight up or very close to straight up. Great for keeping opponents occupied when used with Turtle Bridge, and does good damage if you hit with all hitboxes, which is easy if the opponent is directly above you when you use it. + + + + Mario Bros. Damage: 16% if hit right when the box appears, 6% if hit after the box has been out for about half a second. He holds out a box that hits people as he falls down. It has very high knockback and is good on foes ahead of you or diagonally below you on the ground. This move should be you main aerial because of its very high knockback and damage. However, you should be careful using this near the ground as it has as much landing lag as Donkey Kong Jr. (down aerial) does. He holds a turtle behind him, which waggles its damaging head. Its range and speed are very good, and it usually traps people and hits them multiple times. If G&W hits the ground while using this move, it will skip to the last hit and launch the opponent. Great for racking up damage as it isn't very hard to hit with all 5 attacks. Only use if you almost always hit with all 5 attacks as it's a good approach. G&W shoots some air out twice. The first hit will blow the opponent into the second hit at low damage but will launch an opponent out of range of the second hit at high damage. It has a non-damaging hitbox way above the move that blows opponents up. Use it in moderation for mindgames, but it otherwise isn't very good, as most characters down aerials will hit you too for more damage. Use it depending on your skill and who you're playing against. + + + + Donkey Kong Jr. Damage: 13-14% if hit in midair, then 6% on the ground. He stops, pulls out a key, and jams it down into the ground. This is one of Game-and-Watch's good moves because of its high starting speed and meteor smash capability. However, using it as a meteor smash isn't even used by professionals that much, and is not recommended to beginners. This is because it will give the opponent a chance to hit you while you are recovering, so it is mostly used as a meteor smash while right next to the ledge, where you will not fall down below the stage but will still meteor smash opponents if they aren't on the ledge with invincibility. It has a small start-up lag, but it is very hard for foes on the ground below you to dodge. It's speed and damage are good, but don't use this too much as it has quite a bit of ending lag and players used to you using it a lot will shield-grab you or dodge and hit you most of the time. Chef Damage: 9% if hit by frying pan, 4% from small fish, large fish, bacon, and steak. Mostly the same as it was in Melee; blows up blast boxes and burns foes up close because of frying pan, but throws out different kinds of food now. Best for edgeguarding but slow to stop so it can be easily punished. + + + + Judge Damage for each number is in the next section below. Produces a random number between 1 and 9, causing an increasing relative amount of damage to an adjacent. Some numbers have special effects (e.g. 9 scores a critical hit, similar to Ness's bat attack). It is extremely bad and punishable most of the time from numbers 1-5, but it totally depends on the situation. Game and Watch bounces up in the air on a trampoline damaging opponents. At the peak, he releases a parachute and descends slowly. You can remove the parachute by attacking or air dodging. Effective against lightweight, occupied (already fighting another player and thus not ready to counter) or heavily damaged opponents on a platform above. Also useful for escaping from an enemy-dense area quickly. Be careful however, because if the trampoline is used in close proximity to an opponent, the opponent receives a small bounce as well. You should mainly use this as a recovery, but you can most of the time hit an opponent you launched up with it and hit them with a forward aerial right after as a good strategy. + + + + Oil Panic Damage depends on the projectile. Projectiles you can absorb are Fox, Falco, and Wolf's lasers, Pikachu's neutral and down B, Lucario's aura balls, Ness and Lucas's PK Thunder, Bowser or Charizard's fire, R.O.B. 's laser, and Mario or Luigi's fireballs. By holding out a bucket, Oil Panic can absorb up to 3 energy projectiles that will increase the power of the attack when released. The power of the Oil Panic attack depends on what was collected in the bucket. Therefor, one of the most powerful attacks that can be unleashed with Oil Panic is three of Lucario's fully charged special attacks, whilst he is at 121% damage. His best skill with the bucket is that after he is hit, he can do a neutral air to cancel his hitstun and immediately down-b. This stops his momentum completely. No matter what is percent is or what he was hit with. If he buckets he will not die. If the bucket is full this will not work. Great for Directional Influence  and against projectile spammers (notably Star Fox characters with great laser projectiles) as most projectiles can be absorbed by this. Attack strength 1 or 2%. An attack that won’t even cause your opponent to flinch, and causes G&W to receive a little damage. Attack strength 4%. A weak attack without any special characteristics. Attack strength 6%. An attack with the same characteristics of a fan, meaning it pierces defenses. Attack strength 8%. A slashing attack that functions like a Beam sword. It launches opponents diagonally. Attack strength 4%x3. Three electrical charges zap the opponent and temporarily stuns them. Attack strength 12%. A flame attack. Attack strength 14%. A food item will also appear in honour of the lucky #7. Attack strength 9%. An attack that freezes foes. Take advantage of the opening to attack again. Attack strength 32%. A massive attack!! The opponent will be launched as if hit with the Home-run Bat! He holds a bell high and rings it. + ( or )+ or or He holds a bell out and rings it. + He makes a short hop. 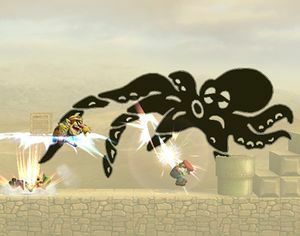 Octopus: one of the longest final smashes in the game, Mr. Game & Watch temporarily transforms into a giant octopus and attacks with his expanding and retracting tentacles, which are controlled by pressing buttons. Also, Mr. Game & Watch can double jump while in this form, however, if he falls off the stage, the final smash ends. Bowser is one big foe to face against much due to powerful standard attacks and special attacks. When he tries to blow fire at you use your special down b to absorb it and once full throw oil back at him. Lucas has PK Freeze, which is relatively slow and easy to catch, but if your only strategy is to just catch it with oil panic, it will usually result in a ton of damage to you. A good tactic is to jump off the stage when Lucas is down there and use oil panic to absorb his up B attack of PK Thunder before he can move it to him and recover. The same can be done with Ness. If you want to use your down aerial, beware his up smash; it is very deadly. Ness has a similar (but not cloned) move-set to Lucas. A good number of Ness' moves can be absorbed by Game and Watch's "Bucket" (down special) for an "Oil Panic" attack. "PK Fire" and "PK Thunder" are two commonly used examples of attacks that can be absorbed. "PK Flash" can also be absorbed, but you don't usually see Ness players using this move, due to the fact that it leaves Ness completely vulnerable. Depending on your timing, absorbing "PK Fire" can fill your bucket 33%, 66%, or sometimes even 100%. Usually, absorbing a PK Thunder will only fill it 33%. When facing Ness, it is advisable to stay out of range of his melee attacks (baseball bat, yo-yo, etc) and his PK Fire especially, as it usually leads to devastating combos. When you have to get close to Ness, I suggest taking advantage of Game and Watch's speed and agility, and stick to short, punishing combos as much as you can. Another great move is to wait for Ness to use his recovery (Also known as "PK Missile"),when he's off the stage, then jump down and absorb it before he takes off. Doing so will stop Ness from recovering, almost always resulting in montage-worthy K.O's. Note: You can NOT absorb the energy from PK Missile. You can absorb PK Thunder, but as soon as it becomes PK Missile, get out of there. PK Missile takes priority over most of Game and Watch's attacks, unless the timing on the attack is near perfect. "Judge" can cancel a PK Missile, but it's a risky, risky move. Snake's missiles are useless with oil panic. Watch out for mines and other explosives, such as mortars, firing into ground. etc. Ganondorf is one of the slowest characters in the game. Although his attacks are powerful, Game&Watch can easily out-maneuver him, setting up for combo attacks. Ganondorf falls quickly so you may only have a second or two for air combos. The down throw and a quick down double hammer will send him sliding across the map, and off the edge. This page was last edited on 19 October 2014, at 02:00.